­The SKS Powerstation, with it's MultiValve system and it's precise pressure control, is one of the most popular bike pumps. As if that was not enough, we now offer the SKS Powerstation with our exclusive HIBIKE design! The world of bike pumps is versatile! There are various types of pumps depending on the purpose and need. Everything here revolves around bar and psi. Doesn't matter if it's mini pump, Co2 pump, floor pump or suspension pump. We shall explain to you the difference: Let's start with the mini pump or hand pump (typical piston pumps), it should not be absent from any bike backpack and should always accompany you in every bike trip. It is the saviour in emergency when there is not enough air in the tire or a tube has to be replaced when on the road. Mini air pumps are small and light and thus can be stowed away with little space, whether in a backpack, pocket or on the frame. When speed is needed, for example during racing, you should pick the practical CO2 pump. The amazingly small pumping wonders (which are available most of the time at 100g) press at top speed thanks to a CO2 cartouche (CO2 cartridge) the necessary air into the tube. The biggest version of the pumps is the floor pump. A good floor pump should not be missing in a bike cellar or a hobby workshop. Lots of air can be pumped into the bike tube in a short time with little strain. The air pressure can be set with a manometre. A feature which the mini and hand pumps mostly lack. 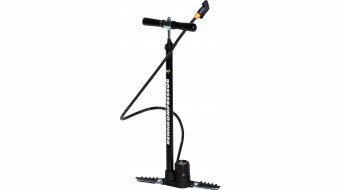 The most well-known floor pump is certainly the SKS Rennkompressor. No matter what kind of pump you are looking for, the type of tube valve plays an important role -the type of tube that you use for your wheel. This is because you need the suitable pump head for different valves. It is advisable to have a universal pump, also called multi-valve pump, which offers various kinds of valve heads. Alternatively you can also choose valve adapters. "SV", the Sclaverand valve, also called French, Presta valve, or road bike valve. The "AV" = autovalve, also known as Schrader valve or American valve. As well as "DV", the Dunlop valve, or Woods valve. Besides the air pumps for the bike tubes, there are also the air pumps for the bike fork or the suspension. You can find them in the category Suspension pumps (suspension systems). They too should not be missing in the repertoir of a hobby mechanic, at least when he is a mountain biker. With these pumps, you control the air pressure of a suspension fork or a rear suspension shock. For this there are reference values with regard to biker's weight and area of use, but the feeling of comfort also plays a role. Whether you want your suspension to response softer or harder, you can adjust the pressure accordingly with a fork or suspension pump. When a bike is newly bought, the bike dealer adjusts the suspension to the biker for the first time. However, it makes sense that mountain bikers, especially full suspension bike riders, have such a pump for air suspension elements (also suspension pump) available at hand among their bike accessories at home. Small, light suspension pumps fit just so in the bike backpack and help adapting on the road the spring elements to the conditions of the trip. Well-known manufacturers in this field are for example SKS, Topeak and Lezyne. Obviously the manufacturers of the suspension also provide the pumps themselves, like Rock Shox or DT Swiss. The air pressure in the fork and shock should be periodically controlled, as usually you don't immediately notice the "lack of air", thus risking damages to the fork or shock. For potential buyers, the handling and weight of the pump should play a role, as well as a high-performance manometer for the exact adjustment of the air pressure via the pressure display. Who doesn't want to bring a bike pump on a trip in the backpack should have a holder fitted to the bike frame or the seat post. Such holdesr and every other kind of accessories for air pumps, such as spare rubber rings, valve heads, spare manometers can always be found in the HIBIKE pump shop. We also have spare and small parts for suspension/fork pumps. Everything you are looking for is in our shop for bike pumps.